Low water pressure is generally a problem when multiple fixtures in the home are turned on at once, such as the garden hose and the kitchen sink. Low water pressure is certainly an inconvenience and can make simple tasks much more timely, meaning that you will want to find a solution as soon as possible. The solution to the problem is first determining the source of the low water pressure, some of which we will list down below. Sometimes water pressure regulators, found underneath the front hose connection of your home, can simply stop working. The good news is that they can be easily replaced by a professional plumber and are also very affordably. Keep in mind that problems can arise when people attempt to make the replacement themselves, so it is best to contact a professional first. If your pipes have been damaged and ended up causing a leak, you will experience low water pressure, even if the leak is only small. To determine whether you’ve had a leak, consult your meter (not your bill). Do this by turning off all taps outside of your home and then reading the meter. Go back to the meter after two hours. 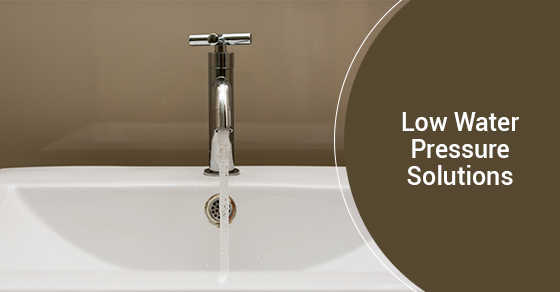 If your water usage is higher, it is likely that you have a leak and should therefore contact a plumber. Older homes and homes built with iron pipes commonly get mineral deposits. Unfortunately, there is nothing you can do to stop the mineral deposits from forming. They do, however, accumulate faster with hot water and horizontal pipes. In any case, if you suspect that mineral deposits may be the cause of your low water pressure problems, contact a professional to make the necessary repairs. A water storage tank that is not elevated above your home will result in low water pressure to allow water to flow via gravity. One possible source of low water pressure is that a lot of people in your neighbourhood may be having a shower or using water all at the same time. Try changing your schedule for a few days to see if you notice a difference. If so, the fix is simple: just change your schedule. Remember that bigger problems such as leaks or mineral deposits are best handled by a professional. Whether you are in need of plumbing, water heating or water services, contact our team of experts at Brothers Plumbing today. We have over 50 years in the industry and offer affordable rates.